Angora 63: Beautiful vintage knitting pattern for girls fair isle cardigan in false fair isle. Late 1930s. In this pattern the slipped stitch creates the fair isle look, easy pattern. Worked in angora, but can easily be replaced by modern 4ply, work a tension square to see if need to change needles to get the correct tension with modern wool. If using vintage angora, still work tension square as needles do differ. The tension is 7 stitches to the inch and 12 rows to the inch on size 7 needles (4.50mm). To fit age nine to twelve chest 27-28 inch. Fabulous pattern from this era. Bairnswear 8: Fabulous vintage child's fair isle jumper and shorts set pre 1920s knitting pattern. This is a super pattern with 5 different jumpers suits, all very typical of the pre 1920's and during the 1920s. These little suits were very popular and can be seen in a lot of old photographs of the era. See illustration below for individual sets. To fit 22 and one to fit 24 inch chest, around 2-4 years old. Knitted in vintage baby wool 4ply. The instructions give suggestions for colours which is a great help if trying to create a period piece. Work a tension square and change needles if needed. Bairnswear 8: Fabulous vintage child's fair isle jumper and shorts set pre 1920s knitting pattern. This is a super pattern with 5 different jumpers suits, all very typical of the pre 1920's and during the 1920s. These little suits were very popular and can be seen in a lot of old photographs of the era. This illustration shows the individual sets. To fit 22 and one to fit 24 inch chest, around 2-4 years old. Knitted in vintage baby wool 4ply. Work a tension square and change needles if needed. Bairnswear 97: Great vintage fair isle knitting pattern for jumper for child aged 2-3 years from the late 1930s. This pattern contains three other jumper and trouser patterns for little boys, but jumpers can be made to suit girls or boys. Worked in vintage 3ply so try modern 4ply in a tension square and change needles if needed. There is a greater range of colour in 4ply and the yarn is nearer the original used. This jumper has shoulder buttons for easy dressing. To fit 22" chest. If you wanted to make a smaller size then use modern 3ply, larger use modern double knitting. Bairnswear 155: Great vintage child's cardigan knitting pattern with fair isle design 1930s. To fit 2-3 years or 23 inches round chest. Knitted in vintage 3ply so try modern 4ply in a tension square. There are instructions for a cable cardigan as well. Colour suggested for this little fair isle cardigan are Jubilee blue, maize, dark brown and red. Nice period design. Bairnswear 1250: Vintage toddlers knitting pattern from 1940s. 3 dear little cardigans, one with ducks round the bottom, one with Dutch boys and girls the other with checker boards round bottom. Knitted in vintage 3ply to fit 20-22 inch chest. Try modern 4ply with a change of needles if needed. Bairnswear1277: Great vintage little girl's fair isle jumper with short sleeves knitting pattern 1930s. This one is to fit 2-3 years 22-23 inch chest. There are three designs in this pattern the one on the cover 'Libby' which is worked in vintage 3ply in sky blue with a darker blue and gold - very typical of the era these colours. There is another short sleeved jumper in rose pink with white and almond ( a very pale green) and a plain little jumper with textured finish. Always work a tension square and change needles if needed. Bairnswear 1291: Great vintag knitting pattern for crossover cardigan and a fair isle cardigan late 1930's. This super pattern has two designs the classic shawl collar double breasted to fit 21 inch chest and knitted in vintage 3ply so try modern 4ply, and pretty fair isle V neck cardigan to fit 20 inch chest also in vintage 3ply so try modern 4ply - colours suggested are white, light and dark green. Bairnswear 1301: Great vintage knitting pattern for fair-isle cardigans for little girls from the 1930’s. To fit 6-10 years. Always work a tension square and change needles if needed. Bairnswear 1307: Great vintage boy's slip over or tank top knitting pattern from late 1930s. This pattern has instructions for thee different designs, one with a sailor dancing a hornpipe, one with alphabet blocks and a plain cable - to fit 3-4 years. The sailor one is in Sky with navy and white with touch of pink and red, to fit 25 inch chest, the ABC sleeveless pullover is a 24 inch chest in lemon with almond contrast and the cable jumper is 24 inches and says that it is just like Daddy wears! All are knitted in vintage 3ply so try modern 4ply in a tension square to get a better fit. Bairnswear 1350: Fabulous child soldier fair isle cardigan jumper vintage knitting pattern 1940s. This lovely pattern has soldiers on guard round the cardigan and on the yoke of the jumper, plus another set with fair isle band on both cardigan and yoke of jumper. To fit 23 - 24 inch chest. Worked in vintage 3ply, so try a tension square in modern 4ply and see if this works better. Bairnswear 1362: Vintage knitting pattern for fair isle sleeveless pullover for boys 8-10, chest 28" and 30". 1930/40's Knitted in vintage 3ply, so try modern 4ply in a tensions square. Bairnswear 1367: Great vintage girl's twin set knitting pattern with fair isle borders 1940s. There is one with a OXO border and a yoke neck to the jumper, to fit 22 inch chest knitted in vintage 3ply so try modern 4ply. The other one has ducks and raglan sleeves, I like the ducks at the yoke of the jumper! This one is also knitted in vintage 3ply to fit 23 inch chest. Bairnswear 1389: Super vintage knitting pattern for golly intarsia hat and scarf set 1940s. This adorable pattern is so retro with golly motifs on the scarf, mittens and hat with long point and tassel - super Christmas gift this one. Also a fancy rib set with pull on hat. To fit 2-3 years old worked in vintage 3ply, so try modern 4ply. Try modern 3ply for smaller size or double knitting for larger size - but if you do this allow at least twice as much yarn. Bairnswear 1383: Great little girl's cardigan knitting pattern with a fair isle design 1930s. This lovely pattern has instructions for 3 lumber jackets as they were called, a fair isle, a button up with collar and a cross over double breasted with reveres. To fit 22-23 inch chest. Knitted in vintage 3ply, so try modern 4ply in a tension square. Always work a tension square and change needles if needed. Bairnswear 1396: Great vintage girl's twin set knitting pattern from late 1930s. This leaflet has two design the plain basket type of stitch and the one with fair isle trim. To fit 28-29 inch chest or 6-8 years old. Knitted in modern 4ply, always work a tension square. Great for re-enactment weekends or themed weddings. Colours suggested are natural for main part and dark brown, rust, coral and Buttercup for the fair isle. Bairnswear 2200: Great vintage girl's fair isle knitting pattern 1940s. Knitted in vintage 3ply, so try modern 4ply in a tension square. To fit 4-6 years or 26-27 inch chest. Colours suggested in pattern are natural, royal blue, scarlet, berberis, gorse, bottle green, powder blue, dusky pink- sounds lovely. Very retro, great for weddings and special theme parties, especially worn with a plain or tartan kilt. Bairnswear 2210: Great vintage boy's tank top sleeveless pullover 1940s knitting pattern. Great for those weekend revival get together, vintage style weddings and parties. This super pullover is typical of the late 1930s and all through out the war years and into the 1950s. This on is to fit 8-9 years or a 28 inch chest. Knitted in vintage 3ply, so try modern 4ply in a tension square to get a better fit. Colours suggest for this one are natural, bottle green, dark brown, berberis (gold), gorse (bright yellow) and ember rust (reddy rust)- sounds fabulous! See main pages for more like this in other sizes. Bairnswear 2213: Great vintage girls vintage fair isle knitting pattern 1940s. Knitted in vintage 3ply, try modern 4ply, work tension square to see if this works better. With British lions motif. To fit 7-8 years (27-28 inches chest), nice fitting rib design. 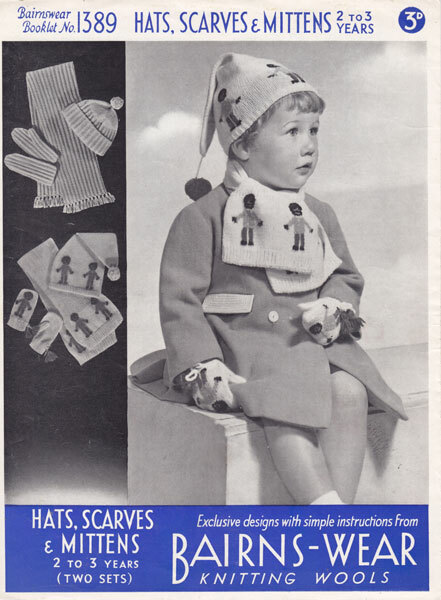 Bestway 84: Great vintage baby and child knitting patterns including fair isle 1940s. This booklet with 16 pages and 8 designs including vest, socks, dress and cardigans and a beret set. Beret, dress, jumper in fair isle as well. To fit between 18 months and 3 years. Lacy cardigan to fit 22 inch chest, fair isle beret set for 2-3 year old, buster suit with fair isle jumper 21 inch chest, dress with fair isle top to fit 23 inch chest and jersey suit for boy with fair isle yoke to jumper, 22 inch chest, button up cardigan for 22 inch chest, and vest for baby about 18 months, and lastly a pair of socks with 5 inch foot on two needles. All knitted in vintage 3ply so try modern 4ply in an tension square and change needles if needed. Bestway84-9: Great vintage knitting pattern girls dress with fair isle yoke 1940s. To fit 23 inch chest in vintage 3ply, so try modern 4ply . From the above book. 4 little buttons fasten the back neck. Bestway 95C-3: Little boys fair isle jumper from the 1940's, to fit a 4 year old chest measurement 24 inches. Chart and row guide given. Bestway 114-1: Fair Isle for Tinies: Vintage knitting pattern for fair isle Jumper to fit boy or girl 2-4years 23"-24" chest. Knitted in vintage 3ply, so try modern 4-ply shades of brown, green and yellow suggested, 5 colours in all are used, but any combination will work. This pattern has charts for the sleeve shaping and neck shaping. 1940's The two patterns below are from this book. Bestway 636: Great vintage child's fair isle jumper knitting pattern from the 1940s. This pattern has instructions for the short sleeved jumper shown here and the long sleeve version shown below on a little boy. To fit 4 years old or 24 inch chest. Worked in vintage 3ply, so try modern 4ply. Always work a tension square and measure child as children tend to be a bit fuller in body these days! There is a little chart for this one. The original model was made in white ground with Hyacinth Blue, Coral Pink, Leaf Green, and Silver Grey. Bestway 636: Great vintage child's fair isle jumper knitting pattern from the 1940s. This pattern has instructions for the long sleeved jumper shown here and the short sleeve version shown on a little girl above. To fit 4 years old or 24 inch chest. Worked in vintage 3ply, so try modern 4ply. Always work a tension square and measure child as children tend to be a bit fuller in body these days! There is a little chart for this one. The original model was made in white ground with Hyacinth Blue, Coral Pink, Leaf Green, and Silver Grey. Bestway 661: Great vintage knitting pattern for fair isle jumper and gloves. Lovely period pattern 1930s in vintage 3ply in Fair Isle to fit 5-7 year old. Cover captures vintage childhood beautifully. Try modern 4ply to see if the tension works better. Always work a tension square. Bestway 983: Great vintage girl's fair isle cardigan knitting pattern from 1940s. This one is to fit 8-10 years or 29 inch chest. There is nota chart but there is a close up picture inside of the pattern - this one is very easy. Always work a tension square and try modern 4ply with this one. The colours suggested are a main bas colour and light blue and navy. Bestway 1507: Great vintage knitting pattern for girl's fair isle cardigan with V neck 1940s. This little cardigan has bold classic motifs with deep welt knitted in vintage3ply. Work a tension square and try modern 4ply. There is a chart for this one as well as writted instructions for the fair isle. Natural base colour is suggested with Dark Blue, Mauve, Light Blue, Green, Yellow, Red and Brown. Bestway 1522: Great vintage child's fair isle jumper knitting pattern from early 1940s. This lovely design is knitted in vintage 3ply so try modern 4ply and allow a little more base colour. Always work a tension square. To fit chest 23 inches or 3-4 years. There is a chart for this one. Vintage colours suggest are silver grey with blue, red and green. Bestway 1594: Great vintage girl's or boy's jumper knitting pattern from 1940s. This super little jumper is the fit 4-6 years or 25 inch chest. Always work a tension square, this one is knitted in vintage 3ply, sotry modern 4ply. Base colour is fawn, with brown, red, yellow and blue. Charted as well as writted instructions. Bestway 1712: Great vintage child's fair isle cardigan and jumper knitting pattern from early 1940s. This lovely design is for a v neck cardigan and short sleeved jumper with a fair isle border. Knitted in vintage 3ply so try modern 4ply and allow a little more base colour. Always work a tension square. To fit chest 22.5-23 inches or 2-3 years. There is a chart for this one. Vintage colours suggest are fawn with blue, brown, yellow and green. Bestway 1838: Great vintage girl's fair isle cardigan knitting pattern from the 1940s. This is designed to fit a 12 year old or chest size 29 inches and is knitted in vintage 3ply yarn, so try modern 4ply in a tension square. There is a chart for this one two as well as writted directions. Main colour, usually a natural or stone with red, yellow, green, brown and blue. Bestway 1853: Great vintage girls little cardigan knitting pattern 1940s. This super little cardigan has rabbits as a border, no chart but closeup picture of the fair isle design inside. Worked in vintage 3ply, but modern 4ply should work always knit a tension square. Chest 27 inches. Original worked in blue with white. Bestway 1904C:Vintage knitting pattern for little cardigan from the 1940's with simple Fair Isle bands. Knitted in vintage 3ply to fit 2-4 years chest 22.5 inches, so try modern 4ply. Bestway 2033: Great vintage girl's fair isle cardigan knitting pattern 1940s. This super pattern has an all over design to fit 2-4 years or 23 inch chest worked in vintage 3ply so try modern 4ply in a tension square. Small chart to help with design. Colour suggested are a main base colour plus blue, red and brown to contrast, probably a natural would have been used. Bestway A2058: Great vintage boys slipover or tank top knitting pattern from early 1950s. This lovely pattern has instructions for this rather smart pullover in three sizes. Grand for weddings, themed parties and re inactment groups. To fit 3-5 years (24 inch chest) 6-8 years (27 inch chest) and 9-11 years (30 inch chests) no chart but easy to follow writted instructions for fair isle band. Shoes good choice of classic colour from this era. Bestway A2069: Great vintage girls fair isle jumper, just like mum's or big sister's (See ladies fair isle pages) This one has a Dutch theme and comes from the 1940's. To fit 11-13 years 29"-30" Chest. This is an easy pattern an develops quickly whilst knitting. Vintage 3ply is used so try modern 4ply in a tension square. Blue and white is fresh, but red and white will be quite Christmassy. Bestway 2119: Great vintage 1940s knitting pattern for boy's slip over. This design is to fit 25 inch chest and is knitted in 3ply. Always work a tension square, you could use modern 4ply and change needle size to a smaller size (the main size used) No chart for this one, but there is a close up photo of the stitches. Colours suggested are vintage dark blue and fawn with rust, dark brown, yellow, gold and light blue. Bestway A2123: Great vintage knitting pattern from 1940s for boy's v neck slip over. This design has a narrow easy to knit fair isle band. Neat and so retro. This little vest it so fit 4-6, 6-8 and 8-10 years or 24, 26 and 28 inch chest. Knitted in a vintage 3ply that should work with a modern 4ply with a change of needles. Always work a tension square in the wool you intend to use. There is a small chart for this one. Bestway 2137: Vintage 'Tiny Tots ' twin set from the 1940's knitted in vintage 3ply. Depicted are Bunny and Bobtail from the 'Tiny Tots' comic. to fit 3-5 years 23" -24" chest. Nice little dressed bunny characters to please even the most modern child. Would look trendy with jeans or short skirt. Pattern in perfect condition. Remember to work tension square to see if you need to change needle size or yarn ply to get size required. Modern 4ply may work better to size. Bestway 2138: Great vintage girl's twin set with fair isle knitting pattern from 1940s. This lovely design is one of my favourites. The little jumper with short sleeves has an all over banded design and the cardigan has the design around the bottom above the rib ad cuffs. To fit 4-6 years or 23-25 inch chest. Bestway 2141: Great vintage knitting pattern from 1940s for fair isle v neck cardigan. This design is to fit 2-4 and 4-6 years or 24 and 26 inch chest. There is no chart but an enlarged illustration of the fair isle. There are 6 contrast colours, vintage pattern suggests natural for base with light blue, mid blue, dark blue, red brown and yellow. Try modern 4ply in a tension square and adjust needle size. Bestway 2161: Cute vintage knitting pattern for child fair isle cardigan and jumper 1940s. To fit 3-5 years and 5-7 years or 24" or 25" chest. This pictures Sonny from the vintage comic Playbox as a motif. Charted. The jumper has short sleeves, but could easily be made with long sleeves. Knitted in vintage 3ply, so try modern 4ply in a tension square. Bestway 2162: Another cute set this time featuring Betty, the rag doll and Golly from Chicks own magazine. To fit 2-4 and 4-6 years or 22"-23" and 24"-25" chest. Knitted in vintage 3ply, try modern 4ply, make tension square first. These are from my vast collection of Bestway patterns. Bestway 2171: Vintage child fair isle knitting pattern from 1940'. This little jumper with a Dutch boy and girl is knitted in vintage 3ply( so try modern 4ply in a tension square) 4-6 years 26" chest. Delightful to knit - very collectable. Children love these picture jumpers! Bestway 2203: Great vintage girl's cardigan set knitting pattern from 1940s. I love this one. Instructions for button up cardigan, bonnet and mittens to fit 3-5 years or 23 inch chest. The cardigan body is knitted in one peice up to arm hole decrease - this helps to keep the fair isle smooth. Worked in vintage 3ply, so try modern 4ply in a tension square. White as the base colour with red and green for the patterning - very Christmassy! There is no chart only written directions for this set. Bestway 2223: Great vintage knitting pattern for child fair isle set, cardigan, beret and mitts knitted in vintage 3ply so try modern 4ply. to fit 2-4 years or 23"-24" chest, nice simple fair isle. Beret diameter across crown 8.5 inches and round edge when stretched 18 or 19 inches. 1940's This pattern is a great one to get started with fair isle, but be warned it can become addictive! Bestway 2315: Vintage knitting pattern for baby. How cute is this? A twinset for a little one. To fit 1-2 years and 2-4 years in vintage 3ply, try modern 4ply for a better sizing. This little set has cats and dogs. Bestway A2332: Great vintage out door set knitting pattern from 1940s. I love these little wartime patterns! This one is for a fair isle jacket and cap with tassel and mittens as well as a pair of trousers - they look like jogging bottoms1 To fit 2-3 years and knitted in 3ply. Try modern 4ply. Always work a tension square. Bestway B2334: Great vintage baby knitting pattern for fair isle cardigan. This colourful little pattern has fair isle borders at waist, cuffs and shoulders. To fit 1-4 years in vintage 3ply, so try modern 4ply in a tension square and change needles if needed. For a smaller size try modern 3ply. Chest sizes 20.5, 22, 23.5, and 25 inches. Bestway B2592: Great vintage knitting pattern for girl's and boy's jumper and tank top 1950s. This super pattern has instructions to knit these bright winter jumpers with deep welts and classic colours, both the round neck jumper and the V neck slipover. To fit 8-10 years (29 inch chest) 11-13 years (31 inch chest) Size change is created by using a size larger needles and allowing a bit more yarn. No chart but simple to follow written directions for the fair isle. Bestway A2654: Great vintage knitting pattern for a little girl's twin set with fair isle from 1940s. This is so simple to knit, a great introduction to multi colour knitting (fair isle) 4 colours are used (saxe blue as a ground with brown, rose and emerald) To fit 24 inch chest or 3-5 years and 26 inch chest for the 5-7 years. Worked in vintage 3ply so try modern 4ply in a tension square with a change of needle size. Bestway A2663: Great vintage knitting pattern from 1940s for young girl's jumper and skirt. There are instructions for a full panelled skirt with elastic through the ribbed waist, and a pair of knickers to match, plus a short sleeved round neck jumper and a polo neck long sleeved jumper with fair isle bands no chart with this one. Knitted in a wool that would be nearer modern 4ply so work a tension square and change needles if needed. To fit 25 inch chest. Bestway A2729: Great vintage boys V neck slip over knitting pattern from 1940s. This deign has a narrow fair isle border, great for beginners. Very retro. To fit 4, 6, 8 and 10 years or 24, 25, 26, and 28 inch chest. Knitted in vintage 3ply that looks as if it will work well with modern 4ply. always work a tension square. Blue, red and navy on a ground of choice. BestwayB2742:Fabulous vintage pattern for girls fair isle jacket. to fit 7-9 years knitted in vintage 4ply, so may well knit up in modern double knitting, work tension square on needles suggested and see if a different size is needed to get the correct size, chest 26"-28", great for Christmas gift. By adjusting wool ply and needles this could be made a size smaller or a size larger. Bestway A2779: Great vintage boys V neck waist coat and jumper knitting pattern from 1940s. This design has a narrow fair isle border, great for beginners. Very retro. To fit 2, 3and 4 years or 19, 20 and 23 inch chest. Knitted in vintage 3ply that looks as if it will work well with modern 4ply. always work a tension square. You might have to change needles. Bestway B3179: Great vintage toddler trouser suit knitting pattern. This little bright set is knitted in double knit, but still work a tension square and change needles if needed. To fit 18 months to 30 months or 22 to 23 inch chest. And 30-42 (two and half to three and a half) 24-25 inch chest. Larger size made by using larger size needles - the easiest way to make a bigger size. Bestway B3228: Vintage fair isle for childs jumper and cardigan to fit 4-6 years old or 25" chest. Knitted in wool thicker than 4ply but not a thick as double knitting so choose which you would prefer to work with then change the needles to get the correct tension with the wool - work tension square in chosen wool and follow directions. Modern 4ply will probably work best. Modern double knitting will knit up just a bit bigger, but allow a little extra wool. Don't for get all these vintage Bestway patterns use 1oz balls unless stated differently in pattern - there is about 29g per 1oz. Bestway B3292: Great vintage babies fair isle jumper knitting pattern. This is a lovely pattern with three different designs, dogs, chicks and flowers and in double knitting yarn. To fit 1-2 years (21-22 inch chest and 3-4 years 23-254 inch chest. Easy to knit raglan jumper for a tiny tot. Bestway 3498: Great vintage little girl's cardigan knitting pattern from the 1950s. This pretty jacket is to fit 2-3 years or 22-23 inch chest and 4-5 years or 24-25 inch chest. Worked in a double knitting wool. Always work a tension square. 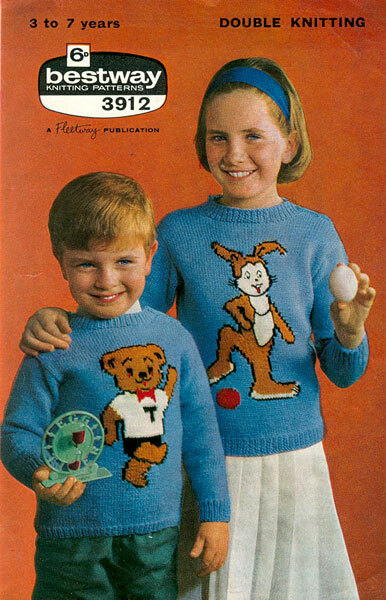 Bestway 3676: Great vintage fair isle knitting pattern for 4-10 year old girl or boy. Great Christmas jumper knitted in double knitting, work tension square to see if a change of needles is need for a good fit. Instructions are in 3 different sizes, chest 23"-29". Bestway 3865: Great vintage knitting pattern child's picture knit jumper with motifs. This pattern has instructions for little round neck long sleeved jumper with Scottie dog, flower or chicken motifs around the bottom above the welt. Worked in double knitting, always work a tension square and change needles to get the correct size if needed. Bestway 3912: Great vintage knitting pattern with Harold Hare and Teddy Bear from the comic. Knitted in double knitting, work a tension square to see if you need to change needles. To fit chest 23"-25" and 25"-27" or 3-7 years.